Liquid water on Mars' surface, but not enough CO2 above to keep it there. Even though Mars is currently too cold and has too little pressure to prevent water from freezing, the planet had liquid water on its surface in the distant past. That could happen if the ancient Martian atmosphere, thicker than its present-day counterpart, had enough greenhouse gasses to keep the planet warm and the water liquid. So over the past decades of our observations and robotic visitations of Mars, researchers have been looking for evidence for Mars' past carbon dioxide levels. The evidence we've gathered indicates there was some CO2 present but not nearly enough to keep water liquid, especially given that the early Sun was less active than it is at present. So far, these estimates contained large uncertainties, so it remained possible that there was enough carbon in the atmosphere to allow the ancient water to flow. A team of researchers has created a new estimate of Mars' ancient carbon levels using data collected by the Curiosity rover. They've also concluded that there was nowhere near enough CO2 to warm the planet to the point where water on the surface would remain liquid. 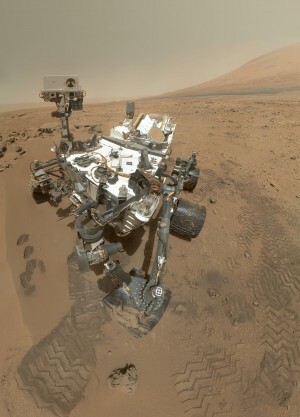 Enlarge / A "selfie" taken by Curiosity (actually assembled from a mosaic of selfies). The rover captured the public's imagination with its daring, Rube Goldberg-ian skycrane touchdown on Mars. During its trip towards Aeolis Mons (the peak at the center of the Gale crater), Curiosity came upon what looked to be the remains of an ancient lake. This was a region of about 70 meters with mudstones, siltstones, and sandstones left behind by ancient water, somewhere between 3.8 and 3.1 billion years ago. The rover analyzed these materials as it passed, but there were no carbonate minerals, which would have made assessing past carbon levels easier. However, certain clays could provide a way to estimate the ancient carbon concentration. When these clays formed, CO2 would have dissolved into their structure. While we can't measure them, we can infer their presence indirectly, as dissolved carbon limits the solubility of iron-bearing olivine. The amount of this olivine in the clays puts a limit on the amount of CO2 that could be in the water that the clays formed in. This technique is also used to estimate Earth’s early atmosphere, but here it’s actually less reliable because the presence of life contaminates the process. The Martian rocks have been comparatively undisturbed, making them prime targets for science. “In many ways, deriving [CO2] estimates from Gale Crater sedimentary rocks is more straightforward than doing so in their terrestrial equivalents,” the authors write in their paper. The researchers made a detailed analysis of the compounds involved in the clays, comparing them to those found in thousands of lakebeds on Earth. The time it takes for various chemicals to mix in with the clays is an important factor as well, as it affects how much of them we’d observe now. The researchers conclude that the Martian atmosphere at the time the clays were formed had a lot more CO2 than the lower limits of previous estimates. But the numbers are still fall far short of what's needed to keep the temperature above freezing. This doesn't definitively rule out the greenhouse explanation; certain environmental processes the researchers are not considering could have changed the composition of the clays. Where does that leave things? It's largely the same predicament as before. This study adds more evidence that Mars didn’t have enough CO2 in its atmosphere to have kept water liquid from 3.8 to 3.1 billion years ago. So either warming was driven by some other mechanism, or somehow the water was able to flow despite temperatures that were typically below. Either conclusion would be interesting. The data also provides more information about a critical period in the history of Mars—around the time these clays were formed, Mars was rapidly losing its atmosphere. This site is among the youngest of the now-dry sites of surface water yet discovered, meaning these clays were probably formed during the tail end of this process. Those were essentially the last days of the wet Mars.